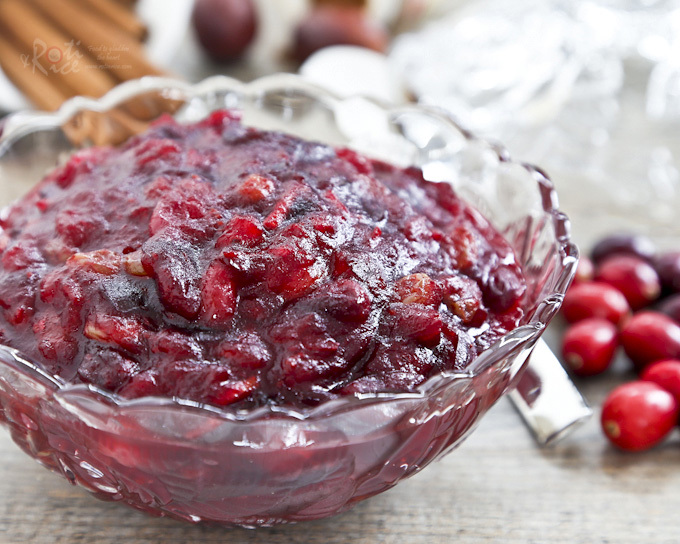 Cranberry Sauce is an essential part of the American Thanksgiving dinner. This sweet and tangy sauce is almost as important as the roast turkey itself and most will consider Thanksgiving dinner incomplete without it. For the uninitiated, the combination of this jam or jelly-like sauce with meats is difficult to appreciate. Over the years after several Thanksgiving dinners, I have fully come to expect it with my roast turkey. Now, I make it yearly for our Thanksgiving table. This recipe was adapted from my trusted Better Homes and Gardens Cookbook presented to me by a friend many years back. This cookbook has gone through many editions but it is still very popular today. I love my copy and it is my constant companion for genuine, home-cooked American dishes. In a saucepan combine orange juice, sugar, cinnamon stick, ground nutmeg, and ground cloves. Cook over medium heat stirring until sugar dissolves. Add cranberries, raisins, and orange zest. Cook and stir for about 4 to 5 minutes until cranberries pop. Remove from heat. Remove cinnamon stick and ladle into a jar. Cover and chill for several hours before serving. 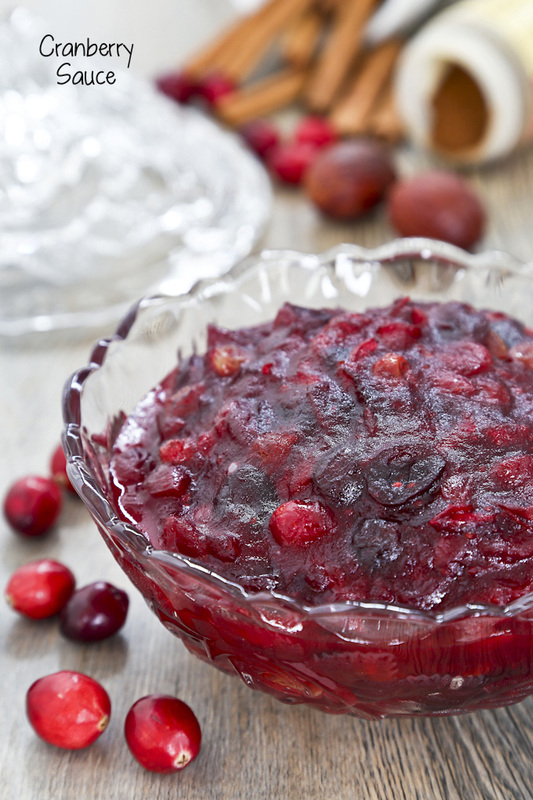 ** If you prefer your Cranberry Sauce to be sweeter, please use up to ½ cup (110g) sugar. I used only ¼ cup (55g) sugar. Some of you may recognize this fun(?) activity around this time of the year. We do this as a family each year by volunteering to bell-ring for the Salvation Army – our little contribution back to the community. We normally register for four sessions of two hours each. Last Friday was our first session and it wasn’t too bad with the temperature at a little below freezing. It gets really, really, really cold in December when the temperature falls down to around -20°F…..brrrrr! NOTE: This post was originally published on November 22nd, 2010. It was updated on November 25th, 2013 with new pictures. A video and further updates were made on November 21st, 2017. I must admit Biren that I find turkey and cranberry sauce strange bedfellows as the assertive taste of cranberries tends to dominate over the neutral flavour of turkey. I do enjoy it with roast pork and duck though 🙂 I wonder if the pairing is more for tradition’s sake rather than compatability? I love how simple your version is, and that it includes raisins – something new for me. I guess it is an acquired taste. Over the years I have come to enjoy it and I think it is really good with the turkey and the stuffing together. Cranberry sauce is easy to prepare and the most fun part is when the cranberries start popping. Sometimes I add more dried fruits and even nuts to make it into a relish instead. Interesting addition of raisins! I actually love cranberry sauce with my turkey, but we don’t traditionally make it every year. I think we should 🙂 This looks great! Yes, this is the American traditional sauce for turkey on thanksgiving. Have yet tried this before. As you know, it’s so so expensive to get the fresh berries here. But the frozen ones are much cheaper. Funny huh! I can’t even find the frozen ones here either, I mean around my living area. Need to go to the city! Thanks for sharing. Btw, I love both chestnuts or marshmallow toasted but not fingers & toes! ha! ^_^ Hope you’re going to have a fabulous thanksgiving. Hugs back to you Rebecca. I hope you have a wonderful Thanksgiving. Such a beautiful looking cranberry sauce! I love the addition of golden raisins. It must have felt nice to warm up by that fire. I wish I had a fireplace! Even i do not celebrate Thanksgiving, but i love the spirit of Thanksgiving. Next time if i would made my 1st roasted turkey and i must make some of this good cranberry sauce. Happy Thanksgiving to you! Biren, Thanks for showing us how to make cranberry sauce. I must try this using frozen cranberries for Christmas as I don’t celebrate Thanksgiving but I still bake turkey almost every year. Ann, frozen cranberries will work just fine. It is very easy to make. Do let me know how you like it. Thanks for showing cranberry sauce. you can also the above dessert. Its very tasty. I love that you guys volunteer for the salvation army! Such a great way to give back to the community. Plus, you get to spend family time together. Definitely something I’d love to teach my kids. For now they’re still too young, but to start them out we will be buying toys to donate so they know there are less fortunate kids. Also teaches them to give rather than always take take take. Love the picture of the pinkies and twinkies…teehee. I’ve never had cranberry sauce with raisins before. Must add a very unique taste and help take away the tartness of the cranberries. Wonderful recipe, Biren. Your sauce turned out perfect :-P. Hope you and your family have a ver Happy Thanksgiving! I like the addition of raisins in your cranberry sauce! Happy Thanksgiving! 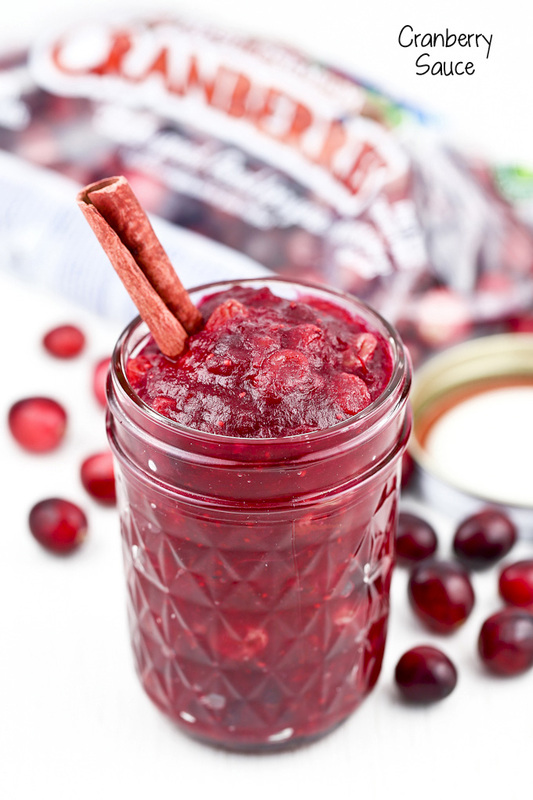 The cranberry sauce looks so festive, warm and delicious! Thanks Alisha and I hope you have a wonderful Thanksgiving too. It is really cold to be standing out there but it is good to give a little something back to the community. HAPPY THANKSGIVING BIREN – Now, I must go and cook up my own batch of cranberries….can’t wait for the feast (once I get all the cooking done) on Thursday and can’t believe it’s nearly here! Look at those cute pinkies and twinkies! That’s a really cool holiday tradition. Your cranberry sauce looks delightful! 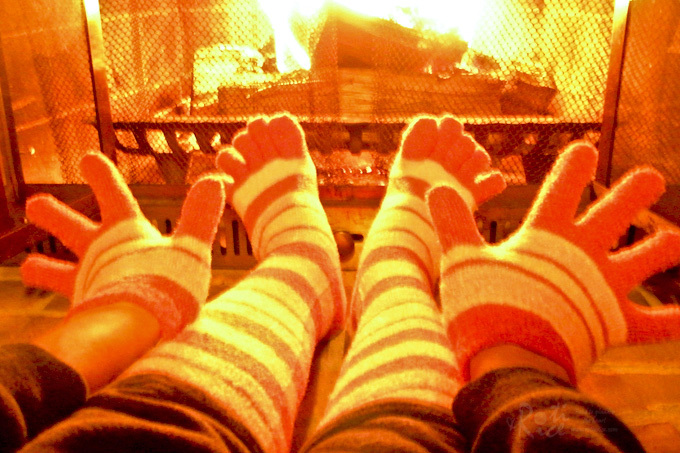 Love the picture of the toes in front of the fireplace! It’s getting real cold here. We are facing Arctic blast this week. Weather report….will be -9 deg Celsius here in Northern Scotland. It just wipes all smiles from my face! I need a bigger fire 😛 Love your cranberry sauce. I can imagine how delicious it is with roasted Turkey. I have to try making one day. The cranberry sauce looks really good! What I like about browsing your blog are all the pictures you took. They’re gorgeous, so right and so colourful. May I ask what camera do you use? Thanks Nasifriet for your compliments. I use the Panasonic DMC-FZ35 and Canon Rebel XT. I am just a beginner and there is much to learn. Cranberry sauce is my favorite part of Thanksgiving!!! Oh that’s sort of sad isn’t it? Happy Thanksgiving!